WALLIS Ladies Black Floral Maxi Dress size 16 Excellent condition . Condition is Used. ideal for your holidays, Dispatched with Royal Mail 2nd Class. 21" from armpit to armpit not stretched and from the top of the shoulder to hemline is approx. Lovely condition and superior quality as you would expect from Wallis. FROM WALLIS A LADIES SIZE 14 PETITE MAXI DRESS. Gorgeous Wallis ladies dress Size 14. This is a brown mix spotty Wallis dress. This dress has been worn. In good condition. Length 38". Wallis Spotted Knee Length Dress Size 18. Wallis Ladies Maxi Dress Size:12UK BNWT. Condition is New with tags. Dispatched with Royal Mail 2rd signed for Class. 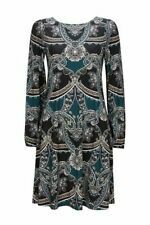 This is a stunning yet very comfortable ladies Wallis tunic dress in a size S (I would say a size 10). Only worn a couple of time but in excellent used condition. Length from shoulder to hem is 85cms and sleeves are 3/4 length. Pet and smoke free home. Dispatched with Royal Mail 2nd Class. Ladies flared black dress, size 14, by Wallis. Ladies simple style knee length black dress. Two side pockets. Loose fit, easy to wear. Versatile style. Good condition. PAYPAL only please within 24 hours of winning bid Any problems, don't leave negative feedback, I always wash and make sure items are in good condition, but sometimes an item slips through the net so.please Email me first , if there is a problem with the item not mentioned in the description, you will get a full refund and return postage paid, no questions asked...I am a very fair and friendly Ebayer! My feedback is extremely important to me. Thank you for looking at my items. For sale WALLIS maxi dress size 10 in very good condition. Pit to pit 18". Wallis Long Shift Dress, Size 18, Previously Worn. Wallis Long Shift Dress, Size 18. 5 out of 5 stars - Wallis Long Shift Dress, Size 18, Previously Worn. 1 product rating1 product ratings - Wallis Long Shift Dress, Size 18, Previously Worn. White/black spotted WALLIS tea dress. Size 10 UK. Machine washable. Keyhole back neck. WALLIS SIZE 14 BLACK WHITE LINED DRESS. LENGTH 36" APPROX. GOOD CONDITION.Condition is Used. Dispatched with Royal Mail 2nd Class. 16" - SHOULDER TO SHOULDER. I BELIEVE THERE IS NO PROBLEM THAT CANNOT BE RESOLVED AMICABLY. 5" - SLEEVE LENGTH (SHOULDER TO CUFF). 38" - LENGTH FROM SHOULDER TO HEM. WILL STRETCH UP TO 22". WALLIS LADIES BLACK MIX CH AIN MIX PRINT DRESS SIZE UK 16 FLATTERING STYLE. Condition is Used. Dispatched with Royal Mail 2nd Class. New listingFANTASTIC**WALLIS**FLORAL DETAIL PULL ON STRETCH DRESS SIZE 14 L@@@K!!!!! You are looking at a great Wallis pull on stretch dress size 14 It’s a green, brown and cream on a black background. It measures 41" long from shoulder to hem This dress is in excellent condition and looks great I pride myself on delivering a excellent service and use a signed for postal service to ensure you receive your item safely. Thanks for looking!!! 💕💗Stunning WALLIS Shift Dress Team up with silver heels and chain to complete your outfit. • Shift Dress. • Gathered Front With Buckle Look. • Navy Blue. Very long wallis maxi dress 12 but would fit up to a 14, Condition is Used. Dispatched with Royal Mail 1st Class. Have listed this dress as a grey colour because there was no option for taupe and its colour is exact to photos like a taupe grey colour with cream spot print. Skirt part flares out. No stretch. Fastens at back with a zip. Beautiful Wallis Maxi Jewelled Dress Size 16. Dispatched with Royal Mail 1st Class. Although it has the Wallis label in it the size label at the neck has been cut out by my ex husband, obviously he missed the Wallis one hidden near the bottom of the dress. A really great addition to your wardrobe and being a classic style you can keep it for ages without worrying about it looking out of date. This sale is for a BNWT Wallis Size 18 Floral wrap over bodice dress. Very flattering ideal Wedding/Cruise/Party. Adorable tea dress size 18 by Wallis beautiful navy blue background with a delicate white bird all over Patten. Pleated around the front of the neck line with a dipped back lovely cap short sleeve with a tie belt the length of the dress from shoulder to hem measures 39 in the bust measurement is 36 inches and the waist measurement is 44 inches. Lovely everyday occasion dress this is a pre-owned item but still in a nice condition, all my items come from a smoke-free home and are carefully washed and ironed before they arrive to you many thanks for looking at my listings on struts 45. Stunning 1940's look tea dress. in black with turquoise green floral print. you have a chance to buy this beautiful dress. 18" from underarm to underarm. 36" from shoulder to hem. Neck line is a wide slash style which starts at top of shoulders, top of shoulder is elasticated. 19" ACROSS THE FRONT PIT TO PIT. Ladies Wallis Petite D ress. Size 8 Petite. Black with Floral Print. Machine Washable. Zip Fastening at back. Wallis Navy Paisley Print Shift Dress. Black and cream maxi dress from Wallis, size 12. Low scoop neck. Short sleeves. Black with small cream flower design all over. 100% Viscose. Lovely cool material. Very elegant dress for the very elegant lady with style . The measurements are 38 /32/40. Look great ! THE DRESS IS BY WALLIS SIZE 14. Pretty dress from Wallis in a size 12 (would fit a 10-12). Mid calf length. Sleeveless, pull-on style. No fastenings. Wallis Maxi DRESS Size Small.